A sample demand letter and accompanying brief, with an instructional memo and preliminary checklist, for plaintiffs' attorneys only. Memorandum re Drafting the Demand Letter and Plaintiff's Brief: This instructional memo by Attorney Kenneth M. Phillips will tell you when and how to compose your demand letter as well as the accompanying Plaintiff's Brief, and to whom you must send them. Demand Phase Checklist: Using this checklist will enable the staff and lead attorney to focus on exactly what tasks must be completed and what evidence must be gathered before the demand letter can go out. Sample Demand Letter: This demand letter is part of an actual settlement presentation by Attorney Kenneth M. Phillips in a dog bite case. The second part of the package is the Plaintiff's Brief (see below). Use this document as a template for the demand letter in your own dog bite case. Sample Plaintiff's Brief in a Dog Bite Case: This Plaintiff's Brief is the second element in an actual settlement presentation by Attorney Kenneth M. Phillips. In the sections of this document, you will see all of the necessary parts of a typical dog bite case involving facial injuries. After studying it, you will know what is needed to forcefully present your case for settlement or win your trial. Sample Paragraphs for a Hand Case: Here are paragraphs you can insert into a Plaintiff's Brief for a case where a dog bit the victim's hand. These injuries require a discussion of disability that does not appear in the sample Plaintiff's Brief. Use these paragraphs if your case involves serious injuries to the hand. 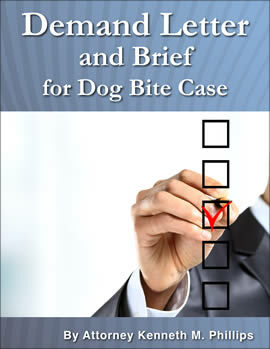 The documents in this package will streamline your handling of a dog bite case by focusing the entire staff on exactly what is needed to settle or litigate the claim. The demand letter presents a dog bite case in terms that are forceful, concise, and easy to understand. The accompanying Plaintiff's Brief provides details about the facts, injuries, treatment and applicable law. When these two powerful documents are sent to the insurance adjuster with copies of photographs and documentary evidence, settlement negotiations will be off to a great start. These documents are taken from Attorney Kenneth M. Phillips' files and are in use throughout the USA. They come with a memo that shows how to customize them for many different kinds of dog bite cases. They are intended for use by attorneys and their assistants only. The time you will save and the results you are bound to achieve will far exceed what you will spend for these documents. You will receive the entire package instantly after you make your purchase, because they are downloaded onto your computer. If you have any problem with the download, use the Contact button (above) to reach Mr. Phillips directly.